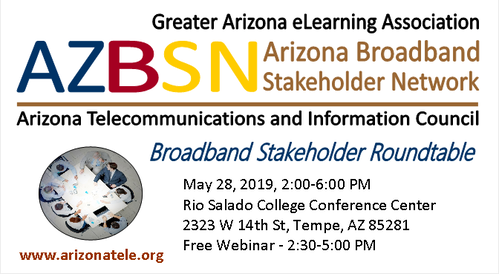 GAZEL, the Greater Arizona eLearning Association, and ATIC, the Arizona Telecommunications and Information Council are leading the development and coordination of the Arizona Broadband Stakeholder Network. On April 25 we will present the first of a series of Stakeholder Roundables from 2:00-6:00 pm in Phoenix Arizona (location TBA). We are inviting associations and government, education and nonprofit organizations like yours to partner with us to promote participation in the Network and Roundable This is not a request for funding. No cash contribution is required, although a paid sponsorship will be welcome. As a cooperating organization you will join other organizations such as the: Greater Arizona eLearning Association; Arizona Telecommunications and Information Council; Arizona Technology Council; Arizona Telemedicine Program; Arizona State Library, Archives and Public Records; Arizona Technology In Education Association; State of Arizona; and many others like you being invited. ​Like water, roads and electricity, in today’s Networked World of anytime/anywhere connectedness, where everyone and everything will be connected, broadband internet access is a critical infrastructure for community development and the health, safety, welfare, educational advancement, and economic prosperity in Arizona communities. Unfortunately, many tribal, rural and other underserved communities in Arizona do not have fast, reliable and affordable broadband access. And many Arizona citizens still do not have the technology and skills to participate effectively in the Networked World. ​The Network and Roundtables will provide Arizona public, private and nonprofit stakeholders opportunities to collaborate on initiatives and strategies to accelerate deployment of affordable and reliable Broadband Internet access in communities throughout the Arizona, and to enable those communities to utilize those connections to: support 21st Century education, create jobs and support economic development; train a 21st century workforce; enhance public safety and health care and; connect their citizens to the world. There are a number of individuals and organizations engaged in initiatives to promote the expansion of broadband deployment in Arizona. These Stakeholders will come together to build a constituency and enable collaboration, coordination, information sharing and communication. They will learn something new, share what they know, make connections with other collaborators, find resources and help for their initiatives, and hear about and provide updates on state and local initiatives in Arizona. The Network may lead to collaborative projects, development of joint grant applications, sharing of funding opportunities and other resources, aggregation of demand at the state and local level, policy discussions and recommendations, etc. To make it easy to help us we will provide you a web icon, and any content you may need for your newsletter, website, emails, etc. ​In return we will include your logo and link to your web site on the Roundtable web page and in our email announcements, and acknowledge your partnership at the Roundtable. You are also welcome to distribute information about your organization at the Roundtable. We will also include your logo and link to your web site on future Roundtable web pages. We will greatly appreciate your support for the Network and Roundtable. Please call or send me an email to request additional information and sign-up here.